A spokesman for the mayor of Buenos Aires is facing criminal charges after saying Hitler "was a spectacular guy." The lead spokesman for the mayor of Argentina’s capital is facing criminal charges after saying Nazi leader Adolf Hitler "was a spectacular guy," a court source told AFP Tuesday. The man, Ecuadoran-born Jaime Duran Barba, has been charged by federal prosecutor Guillermo Marijuan with voicing approval of a criminal act, the source told the news agency. Barba is a top aide to Buenos Aires Mauricio Macri, who is also a possible 2015 presidential hopeful. Argentina is home to the largest Jewish community in the Americas outside the United States, with some 300,000 people. Macri slammed his spokesman's remarks but did not say if he would be fired. The controversial remarks were made in an interview Barba gave to the weekly Noticias. In the interview, he compared late Venezuelan leader Hugo Chavez with the Nazi German leader. According to Barba, both Chavez and Hitler "had huge approval ratings.” When the reporter who interviewed Duran Barba said he could not compare the two, Barba shot back: "No. Hitler was a spectacular guy. He was very important in the world." Responding to his spokesman’s comments, Mayor Macri said, according to AFP, "There simply are no possible positive words for the man responsible for history's largest genocide." At the same time Macri stated that he would defend his spokesman's right to free speech. Argentina's Jewish community has faced no shortage of anti-Semitic incidents, and the country gained a reputation as a haven for Nazi war criminals after World War II. Latin America's worst terror attack in modern history in 1994 targeted the Jewish community in Argentina and remains unsolved. The van bombing of the building of the Argentine Jewish Charities Federation, or AMIA, left 85 people dead and 300 others injured in Buenos Aires. Since 2006, Argentine courts have demanded the extradition of eight Iranians, including former president Akbar Hashemi Rafsanjani, former defense minister Ahmad Vahidi and Mohsen Rabbani, Iran's former cultural attaché in Buenos Aires. In January of 2013, Argentina announced an agreement with Iran to create an independent commission to investigate the 1994 AMIA bombing. 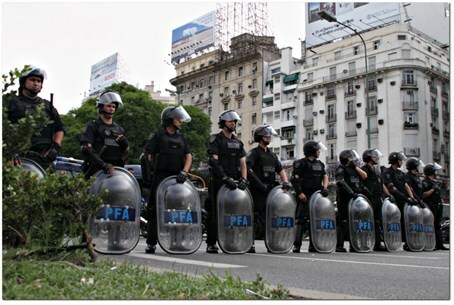 Leaders of Argentina's Jewish community have criticized the accord. Washington has also cast doubt that any solution will emerge from the deal between Iran and Argentina. A few months ago it was reported that Iran’s new president, Hassan Rouhani, was on the special Iranian government committee that plotted the 1994 bombing. The report was based on a testimony by a former Iranian intelligence official who said that the decision to launch the attack was made within a special operations committee connected to the powerful Supreme National Security Council in August 1993. The official reportedly testified that Rouhani, who was then serving as secretary of the Supreme National Security Council, was also a member of the special committee when it approved the AMIA bombing.